During our four-night camping trip with my wife’s family in Arizona’s Verde Valley, we definitely wanted to take everyone to see Montezuma Castle and Montezuma Well. In total, we would have a group of 13 people, ranging in age from 4 to 71, plus three dogs! This area is a National Monument, and we were skeptical about being to go as the National Park Service often bans dogs from park trails. However, a quick Google search revealed that this park allows dogs. Game on! Walking the path to Montezuma’s Castle. Beaver Creek provides lush trees on the left, but the desert cliffs on the right are clad with only creosote bush. It was a cool Saturday morning, and the parking lot at Montezuma Castle National Monument was nearly full. We gathered our crew and made our way to the Visitor Center. In hindsight, we didn’t spend much time inside, and the exhibits did look pretty interesting. With all these dogs and kids, however, we had to keep moving. The rangers at the front desk were very nice, and between the three America the Beautiful Passes that we had scrounged up, we were able to get everyone in without handing over any extra cash. Onward! We discovered the path to be paved with concrete, well-graded, and easy to walk. The scenery is subtlety stunning. Walking into the park, the path happens to split the line between two distinct eco-systems. On the left, giant Sycamore and Cottonwood trees tower overhead, their leaves lush and green thanks to the water of nearby Beaver Creek. On the right, the land starts to rise into towering limestone cliffs, and vegetation quickly transitions into parched desert slopes bearing only creosote bush and other arid shrubs. The view of Montezuma Castle itself seemed to come out of nowhere after being immersed in such pleasant surroundings. Tucked up in the cliffs, the well-preserved cliff-dwelling captured our awe. The first view of the Montezuma Castle cliff dwelling from underneath the shade of an Arizona Sycamore. Wait, did Montezuma actually live here? In the movie The Hangover, Zach Galifianakis’ character asks a Las Vegas hotel receptionist, “This isn’t the real Caesar’s Palace, is it?” You could ask the same about Montezuma Castle, and receive the same answer: No. Montezuma, leader of the Aztec civilization, never lived here. The name Montezuma Castle was dubbed by American explorers of the 1800s that mistakenly believed the ruin was built in connection with the Aztecs. Not so! The Sinagua people were the real residents of Montezuma Castle, living in and around the dwelling for around 300 years. The Sinagua built and moved into the Castle almost one-thousand years ago, sometime around the year 1200 CE . They looked at the diverse terrain and saw a great place to call home. As a farming tribe, the Sinagua needed access to water for their crops. Beaver Creek provided an almost unlimited source of water. Also, its flood plains provided the relatively flat ground needed for their fields. Dwelling in the high cliffs above served a different purpose: an element of protection, the advantage of higher ground, and a commanding view of the surrounding landscape in the case of invading marauders. Corn was the staple of the Singuan diet. They grew and ate other crops as well, but corn was king. One of the benefits of being an agricultural civilization is the ability to store food. Two small “graneries” are even visible in the cliff face to the right and below the main Castle structure, providing food stores for the Castle residents. Our group listens to an audio program describing the way of life at Montezuma Castle. The Castle itself is a five story pueblo, the walls built from rock rubble collected from the base of the cliff. A mud plaster coats its walls, giving it a remarkably smooth appearance. Its 20 rooms likely housed about 35 people. As the Sinagua had a stratified social structure, perhaps this cliff-side castle housed some of the Sinaguan “high society”. The 100-foot high Castle was not the only pueblo on site, nor was it the largest. At the base of the cliff sits the ruins of another 5-story pueblo; archaeologists call it Site A or Castle A. Clocking in at over 40 rooms, this structure was twice the size and capacity of the main dwelling. Visitors can walk right up to the base of Site A to this day. 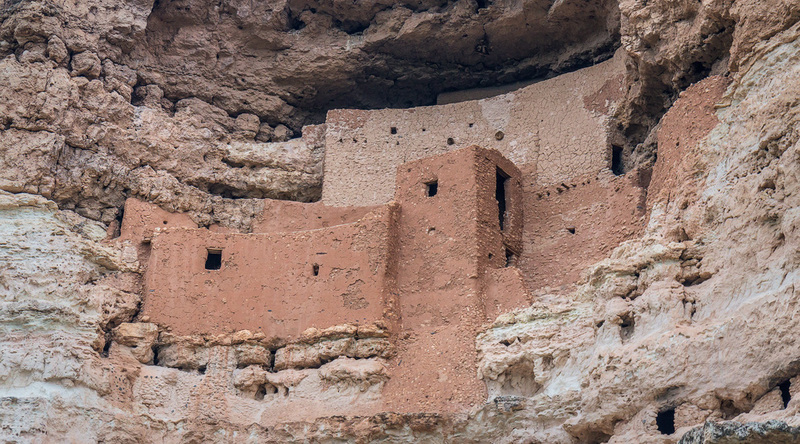 About 700 years ago, the Sinagua mysteriously disappeared from Montezuma Castle. We can trace their ancestry to the modern Hopi tribe, but the first-hand story of why the Sinagua left has been lost to the sands of time. However, Montezuma Castle is still home to cliff-dwelling residents today: birds. Cliff swallows build clay nests on the underside of overhanging ledges. These are most easily viewed from the path where it dead-ends at Site A.
Clay nests built by cliff swallows above the Site A pueblo ruins. Associated with Montezuma Castle is the nearby Montezuma Well, also protected and maintained by the National Park Service. Montezuma Well is a sinkhole in the limestone bedrock that has collected quite the pool of water over time, and was a home to a Sinagua cliff-dwelling, as well as being a water source. After visiting Montezuma Castle, we drove 15 minutes down the road to visit Montezuma Well. As we arrived, we happened to be greeted by dark, forbidding clouds overhead! Unlike Montezuma Castle, this destination does not require an entrance fee. The nice volunteer ranger at the parking lot did remind us to watch our dogs around the trailside cactus. As we walked up the steep, concrete path, my childhood memories of this place were so distant that I didn’t have much for expectations. Cooper and Ty follow the rest of our posse out to the lip of Montezuma Well. Consider this: going by their names, it definitely sounds like Montezuma Castle is way more spectacular than Montezuma Well. In medieval times, the castle was a symbol of power and beauty, a striking structure commanding attention over the surrounding land. In contrast, a well was a rather benign piece of construction, necessary for life, but unassuming as far as looks go. Unless it was poisoned, or someone fell in it, the town well never got much attention. Replicating this history, Montezuma “Well” seems to get tossed from spotlight in favor of the nearby “castle”. As it so happens, I found Montezuma Well to be even more impressive than the “Castle” down the street. In terms of geology, and aesthetics of landscape, it is quite a spectacular piece of property. The context is also important. In our parched Arizona landscape, creeks flowing out of the nearby high country are fairly common. Giant sinkholes holding permanent and substantial water stores are rare. Perhaps, one of a kind. Gloomy skies over the impressive, water-filled sinkhole that is Montezuma Well. Sinagua cliff-dwellings are visible just below the rim. While the natural scenery is amazing, so is the human element. As one walks the path around the rim of the sinkhole, Sinaguan cliff-dwellings come into view, tucked into the limestone just below the lip of the well. The fact that ancient people lived here and used this water as a source of life adds another wrinkle to the importance of this place. Yet the most surprising part of Montezuma Well, in my opinion, is the spring on the “backside”. A short, steep paved path leads down into this lush underworld. Once more, Beaver Creek flows through a narrow forest of Cottonwood and Sycamore. As the path swings left, a canal tucked into the forested hillside seems to appear out of nowhere. A canal left over from the days of the Sinagua, once again, feeding the drops of life to their nearby fields. Yellow Columbine in the unexpectedly lush ecosystem underneath Montezuma Well. We were fortunate enough to visit in early summer, and this spring-fed canal was surrounding by bushes of yellow columbine. It so happens that columbine are heavy-hitters on my short-list of favorite wildflowers. My jaw literally dropped when I saw them growing here! In Arizona, yellow columbine are common in the lush forests high in the mountains, blooming at the height of summer at elevations above 10,000 feet. They can also be found lower, along wet and vibrant creeks in steep and narrow canyons, like Oak Creek Canyon. Probably the lowest elevation I had spotted them was MAYBE 5,500 feet above sea level. For yellow columbine to prosper here at 3,000 feet, surrounded by parched desert, this is truly a special place. Geologically, even hydrologically, this little spring eco-system is even more fascinating because the water is provided by the pool in the sinkhole on the other side of the ridge. Truly unexpected. I wonder: did the ancient Sinagua realize how amazing a place they found as their home? I’m certain they did, but probably not for the exact same reasons that served to blow my mind! Hanging out at the spring on the backside of Montezuma Well. Was it Really Dog and Family Friendly? Yes! Our entire group had a fantastic time! Montezuma Castle in particular is great for all walks of life, with smooth ADA compliant pathways and relatively short walking distances. Montezuma Castle, like all National Parks and Monuments, has a Junior Ranger program. Just ask at the visitor center, and each will receive a Junior Ranger workbook. They will have to complete a couple activities, and in the process learn and appreciate more about the park around them! Our 4 year old niece earned her Junior Ranger Badge while there, so it’s not just for older kids either! If you’re bringing the Grandparents, depending on their mobility, Montezuma Well may be a little more trying. It is a paved path, but it’s uphill with some sets of stairs. For the kids and the dogs, however, it was perfect! Once again, we were super impressed with this park for allowing and welcoming dogs to come visit! Thanks so much to Montezuma Castle National Monument! Working on Junior Ranger activities along the path at Montezuma Castle. Montezuma Castle and Montezuma Well are located in a mid-elevation desert at around 3,000 feet in Central Arizona. As such, the weather can have remarkable extremes. If you travel in the summer, the weather is almost guaranteed to be hot, likely over 100 degrees Fahrenheit. In contrast, it can get cold here in the winter, and if you happen to go during one of the colder winter storms of the year, you may even see snowfall at these locations! Violent and isolated thunderstorms are also common, especially in late summer. The exposed trails at Montezuma Well should be avoided during lightning storms especially. Our own visit in early May was met with a downpour toward the end of our visit! As you should when doing any traveling, watch the weather and plan accordingly. No matter what time of year you visit, bring water for every human and pet in your party. Even a short time in the sun, especially for young children, older people, or dogs can cause rapid dehydration. Keep everyone hydrated and you’ll have a blast! Keep your dogs safe and happy while on the trail. Ours sure were! Fees: $10 per adult (16 or older), kids 15 and under are free – show any of the America the Beautiful Passes and get up to 4 adults in for free with each pass. Other Notes: Dogs Allowed! ADA Compliant Paths!